It's hard to believe now, but there was a time, not that long ago, when beauty subscription services were the new thing. One of the first to specialize in one specific product was Julep, as I'm sure everyone knows, that specialize in nail polish and nail care items. I've been a Maven- they call their subscribers Mavens- since the beginning, but haven't blogged about them for some time. Time to change that! 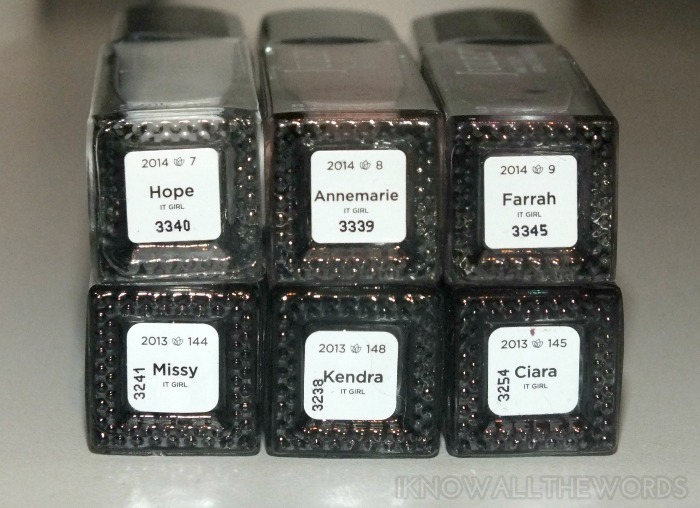 Read on for a Maven overview and swatches of some It Girl shades. 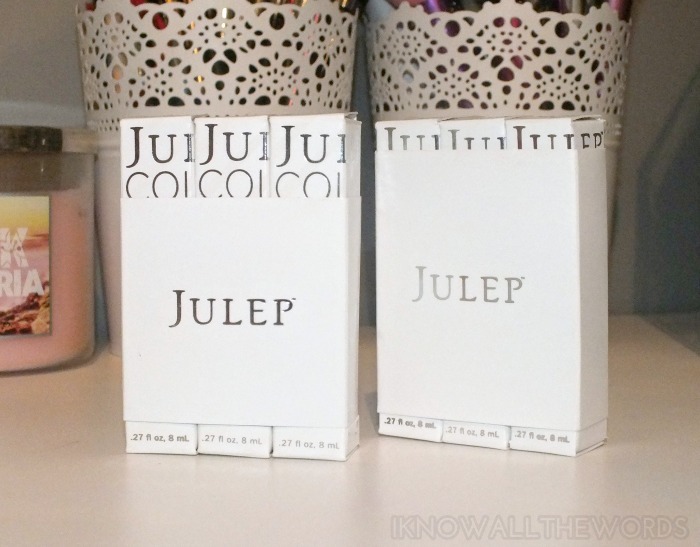 As I mentioned, I've been a subscriber since the beginning, and as such have seen quite a few changes as Julep found it's footing. Their were quite a few missteps in the early days with their referral system and general practices which turned off quite a few subscribers. I didn't have too many issues then, but will say that you do have to be mindful of your subscription to get the most out of it. I won't go over all of the details as it's pretty simple (details here), but I will say that if you plan on skipping months, keep an eye on the date. I already have a lot of polish, so I have to really love a colour to feel the need to buy it, so for that reason I've been skipping most of my Julep boxes. You're allowed to skip months whenever you want, as you're supposed to get an email when the selection window is open, which allows you to add extras to your box (at an additional cost) and change your selection if you like. The thing I noticed, is that after I had skipped a few boxes, I wouldn't always get the notification email and miss the window to skip my box. I wouldn't realize it until I found the package in my mail box (which is how I ended up with the polishes I've swatched below.) It's kind of a dirty trick on Julep's part. There have been quite a few positive changes made to the Maven service though. The polishes now come nicely packaged and boxed which makes them far less likely to leak during shipping- an issue I've had quite a few times as the lids never seem to be fully screwed on. Also, they're properly labeled now, which is a small thing, but so annoying when it's not there. Early bottles had ugly bar codes on the side with the name and some of my first aren't labeled at all. I can't stand a nameless polish. One of the neater innovations, is the swatch labels that come on the bottles now. They allow you to put a little dot of the colour on the lid so you can see what is what when the bottles are stored upright. A great thing for those with a larger collection. Hope is described as being a 'stark white satin' which is pretty much what it is. The fact that the shade is matte, makes the white softer looking, so I wouldn't call it stark once it's on. The formula of this shade is pretty good, especially for a white shade as it's not too thin, had only minimal streaking (applying thicker coats worked to minimize streaking) and applied in just two coats. I quite like Julep's Stain finish, as it's a semi-matte with a soft look and feel. Farrah is described as being a 'lilac silk' but there is more going on once you get this on the nail. I'll admit that I wasn't really a fan of this shade when I saw it in the bottle as it just looks too frosty and like it would be all brush-strokes and nothing all that attractive. 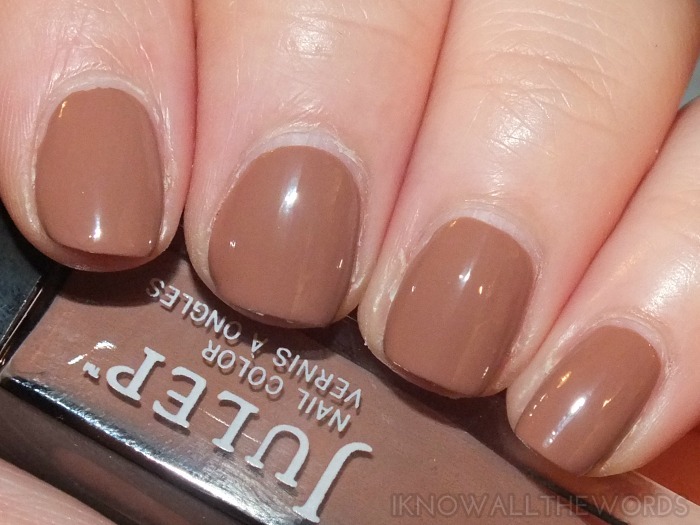 On the nail though, there is a taupe-y undertone and the shade is quite pretty. Brushstrokes, luckily, were not an issue either. The formula is a little thin, and needed three coats for full opacity. This shade is what Julep calls a 'Silk' which dries to be a soft semi-matte. 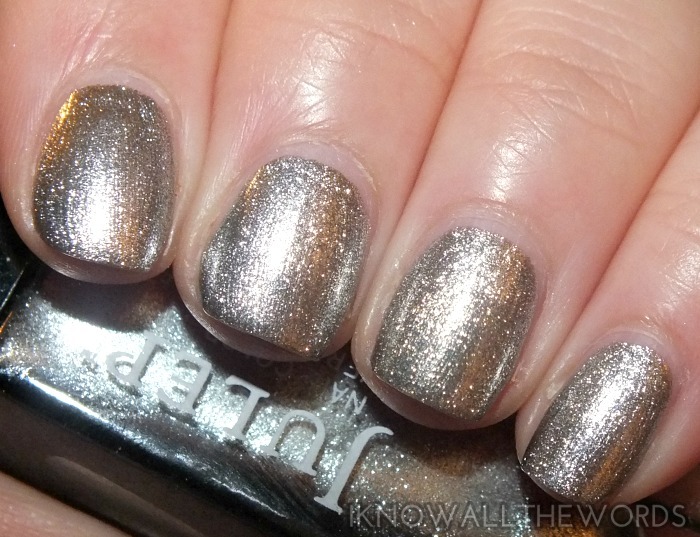 Missy is what Julep calls a 'titanium metallic' but it's so much more! In my notes I called this robot nails- complete with copious underlining and heart doodles. I LOVE this shade! Metallics aren't always my favourite because of brush stroke issues, but because this is both a shimmer and a foil they're not an issue. This shade is a bit darker than other silver foils, which gives the shimmer a bit more dimension and pop. The formula is perfect too- two easy coats. Again, I LOVE this shade and will be wearing it A LOT. Kendra is described as being an 'army green frost' but again, it's more than that. 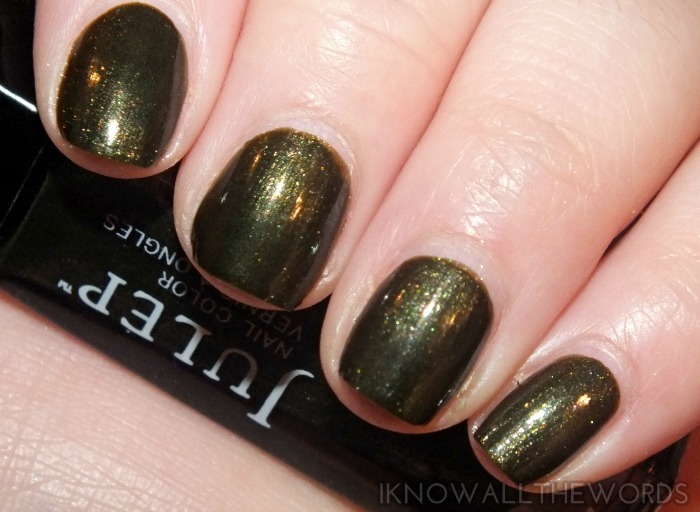 Kendra has a deep army green base with scattered gold and bronze shimmer that glows through. Easy formula to work with, perfect in two coats. Ciara is described as being a 'vampy magenta with teal microglitter.' The base is les magenta, and more of a blackened purple and the teal microglitter has more of a duo-chrome like presence that reminds me of MAC Club. The shade is gorgeous, although tricky to photograph. The formula seemed quite thin on the first coat, but built up well and only ended up needing two coats to reach full opacity. Overall, Julep has upped their game in terms of polish quality, as their formula seem to be much more consistent now than my previous experiences. 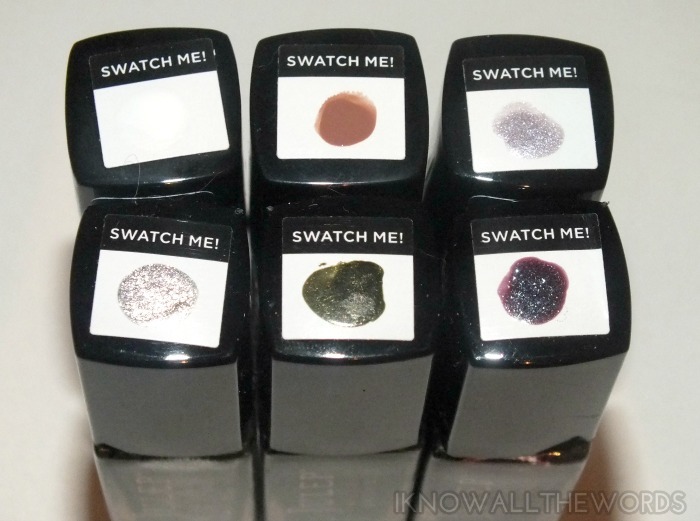 Their Maven subscription service is not without it's issues, but overall is a great idea for anyone who loves polishes as their colour range is huge and they are always introducing something new. Have you ever subscribed? 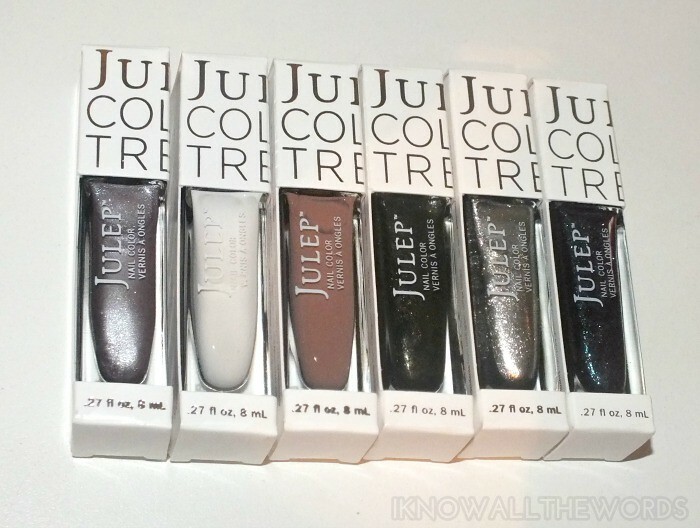 Tried Julep polishes? Thoughts?